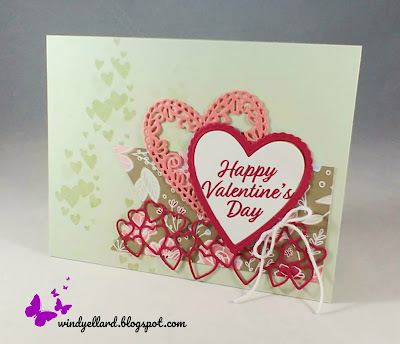 Yes, there is a little red along with my Valentine's Day card! Forever Lovely in same color on left side. the Triple Banner punch to make it a banner. I cut the heart frame and the string of hearts in Lovely Lipstick. called Be Mine Stitched dies. I finished it off with a white twine bow. Head over to Festivefridaychallenge.com to play along this week.